After Babycorn Manchurian I'm back with my nephew Kedar's favorite item list. To come to think of it....the list is quite big ;)....he likes Palak Paneer a lot and recently on 25th Dec we went to Kashmir Restaurant in Race Course Road to celebrate my sister's birthday we ordered palak panner and he told me Pinni it's not like you make :-)...ya that's one thing he keep telling me where ever we eat whether it's a restaurant or at any friends place ! I would recommend to any visit Kashmir in Racecourse road if you are looking for good North Indian food they have wide variety of vegg and non-vegg dishes. Do try the Sheekh kabab (veg or non-veg), chicken tikka, kadai chicken, papadi chat, kadai paneer or simply ask for Chef recommendation. Whatever it may be but do try the Mango Lassi there...it's simply yummy. If any of you do visit..then let me know how did you liked it. 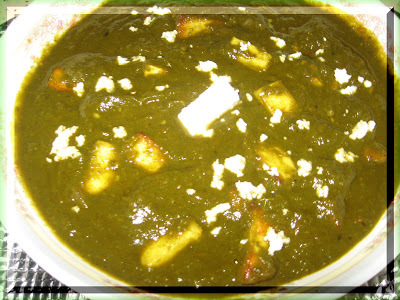 So coming back to the recipe ..I have made palak paneer one of these days and Kedar happily ate. 1. 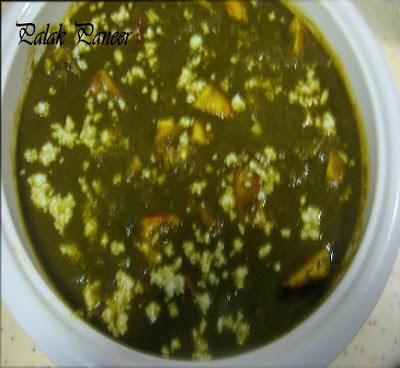 Clean and blanch the spinach, green chili, ginger. Remove from hot water, keep the spinach in running water for a minute or two and keep aside. 2. 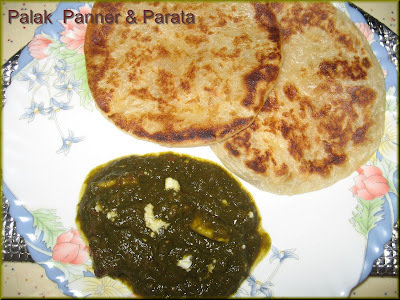 Make paste of spinach, ginger, chilli, cumin seeds. 4. In the same pan add remaining oil and heat. Add spinach paste and cook for 5 mins. 5. Add chili, turmeric powder, salt and mix well. If required add 1/4 cup water and simmer for 2-3 mins more. 6. Add fried panner and cook for 2 mins with lid on. Server with paratha, puri, roti, pulav or anything. 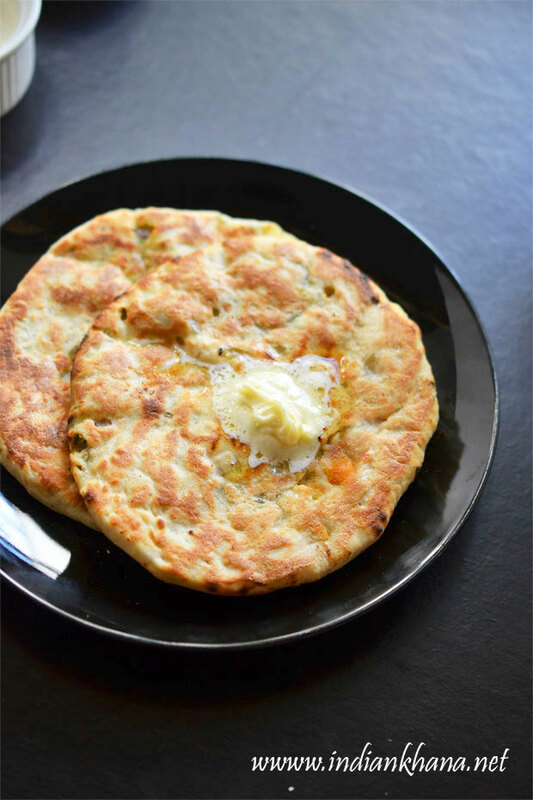 I have server with instant paratha. And this also goes to Alka of Sindhi Rasoi 'Just for You' event. 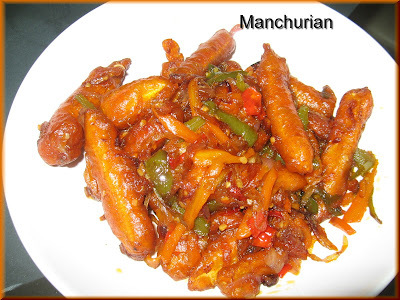 Manchurian is my nephew Kedar's favorite, he always wants me to make it..though I have to make Gobi Manchurian for long time now but that's not just happening. 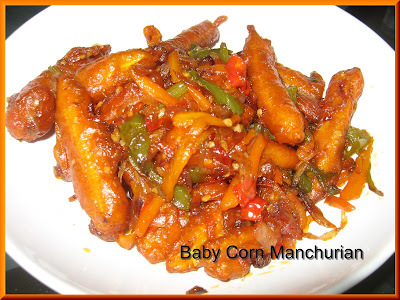 Meanwhile he got this lovely looking baby corn from cold storage and I thought of making baby corn Manchurian for him. It was just yummy and everyone liked it very much. I used my own version to make this. 1. 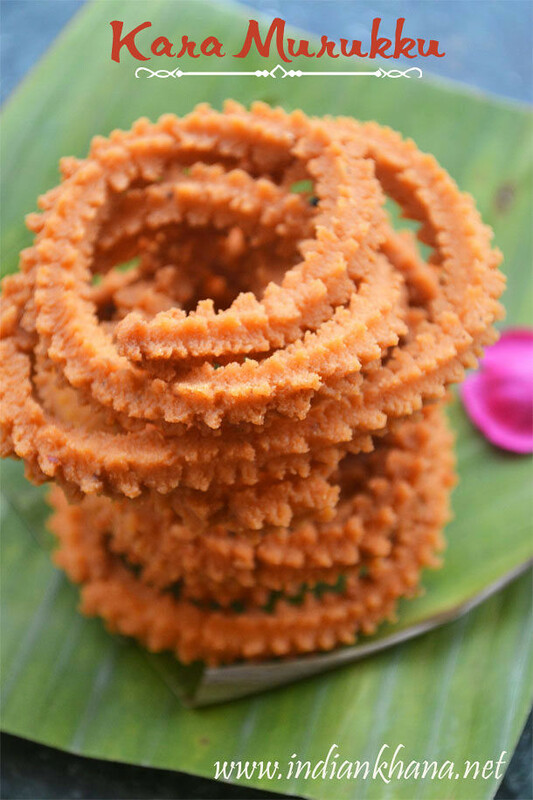 Mix corn flour, all purpose flour, 1tbs redchilli powder, 1/2 tbs ginger-garlic paste,salt & water with the consistency as pokada batter. 2. Dip baby corn in the batter and deep fry them in medium heat until golden brown. Keep them in kitchen towel to remove excess oil. 3. Dice carrot, capsicum & slice onion and green chili. 4. In a pan heat 2-3 tbs of oil, add onion and saute it. Now add remaining ginger-garlic paste and mix well. 6. Mix everything well and cook for another 2-3 minutes. If you have spring onion, chop then and add now. 7. Now add the fried baby corn in the veggie mixture, combine everything. Garnish with coriander leaves and server hot. Kedar really loved this and wants me to make gobi manchurian soon now , since this is special dish for my nephew I decide to send this to Alka of Sindhi Rasoi 'Just for You' event. 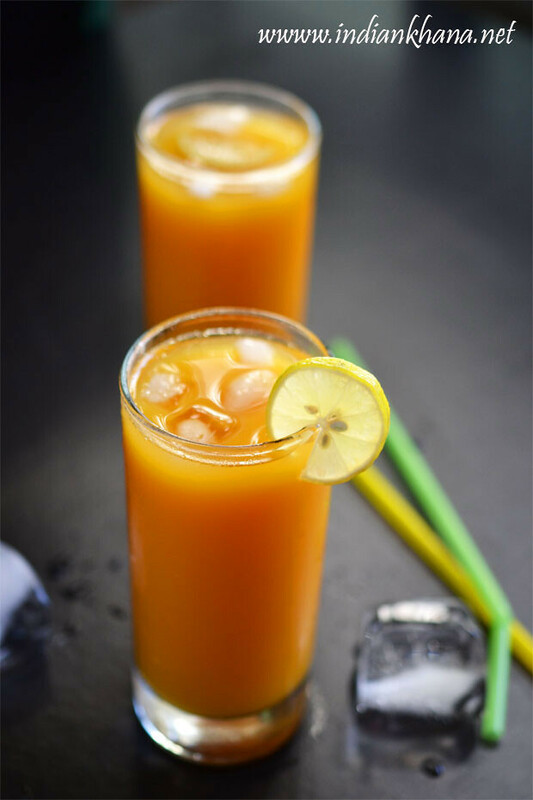 Dear Aru of Gourmet Affair has passed me Lemonade Award, Thanks you so much dear...I would like to pass this award too Purva, Lakshmi, Priyanka, Sowmya, Anisheetu, Sukanya, Vani, Rekha, Ramya and Raji. Enjoy the award gals. 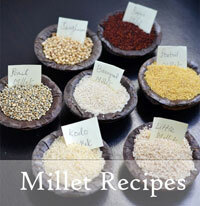 Hi, hope everyone is celebrating Sankranti/Lohri/Pongal with much joy and fun. Here in Singapore we really don't feel the joy of Pongal though one can get everything as in India. But the fun and fare is still missing. Pongal is also associated with sugarcane in TN and so in Chennai...it use to so much fun during the 4 days of celebration from Bhogi to Maat Pongal...ahh well I really do miss Chennai for all these things. Coming back to reality, I have made Venn Pongal on Pongal...as that's the perfect and simple thing to do. So lets check the recipe....for the benefit of those people whom doesn't know much about this wonderful thing call venn pongal. 1. Pressure cook washed rice and dal with salt and 1/2 tbs black pepper. Add more than double quantity of water and cook for 3-4 whistle. 2. Give a dry run of cumin seeds, remaining black pepper and ginger in mixi, keep it aside. 3. Wait until release of pressure from cooker, mix the cooked rice and dal well. 4. In a pan heat ghee add dry red chilli, cumin,ginger and pepper mixture and cook for 2 mins. 5. Add cashews, curry leaves (if using) and mix until cashews turns light brown. 6. Now add the rice and mix well. Cook for 2-3 mins. 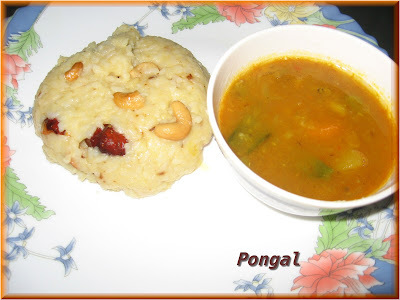 Server hot pongal with chutney or sambar with more ghee, enjoy to fullest...simply yummy pongal. And this is my entry for Festive Food: Makar Sankranti event hosted by me. As promised am here with Festive Food: Makar Sankranti event details. Before that did you guys checked Christmas Feast Event Roundup? Do check it out. So, here is Festive Food next event. Makar Sankranti is celebrated every year on JANUARY 14th. Makar Sankranti marks the end of a long winter with the return of the Sun to the Northern Hemisphere. Makara literally means 'Capricorn' and Sankranti is the day when the sun passes from one sign of the zodiac to the next. The Sankranti of any month is considered auspicious as it signifies a fresh start. However Makara Sankranti is celebrated in the month of Magha when the sun passes through the winter solstice, from the Tropic of Cancer to the Tropic of Capricorn. This festival has been celebrated for thousands of years. Initially, this was probably a festival celebrated in the cold climate, when people prayed for the warmth of the sun. In all likelihood, the Aryans celebrated it, and continued to do so after migrating to India. Today, Makara Sankranti is celebrated throughout India as a harvest festival. Makar Sankranti marks the commencement of the sun's journey to the Northern Hemisphere and is celebrated on the 14 of January every year all over India. It is also a celebration of the harvest festival. People take dips in rivers and worship the Sun God especially in the holy Ganges river. The dip is said to purify the self and bestow "punya". Special puja is offered as a thanksgiving for good harvest. According to folklore, girls who take the holy dip get handsome husbands and boys get beautiful brides. Makar Sankranti is perhaps the only Indian festival whose date always falls on the same day every year i.e. the 14th of January. Can you guess why? This is because the festival of Sankranti is based on the solar calendar unlike the rest of Indian festivals, which are based on the lunar calendar. During six months of the year, the days are longer than the nights. During the other six months, the nights are longer than the days. Have you noticed this? The first period is called Uttaraayana. Uttara means north. Then the sun moves north from the centre of the sky. The second period is Dakshinaayaria. Dakshina means south. The sun moves southwards now. The Uttaraayana starts roughly in the period January-February. The day Uttaraayana starts is called Makar Sankranti. That day is very auspicious. We celebrate it as a festival all over the country. People bathe in holy waters. They worship the sun-god and give away gifts. During the six following months, happy events like marriages are celebrated. In Bengal every year a very big Mela is held at Ganga Sagar where the river Ganga is believed to have dived into the nether region and vivified the ashes of the sixty thousand ancestors of King Bhagirath. This mela is attended by a large number of pilgrims from all over the country. In Tamil Nadu Sankrant is known by the name of ‘Pongal’, which takes its name from the surging of rice boiled in a pot of milk, and this festival has more significance than even Diwali. It is very popular particularly amongst farmers. 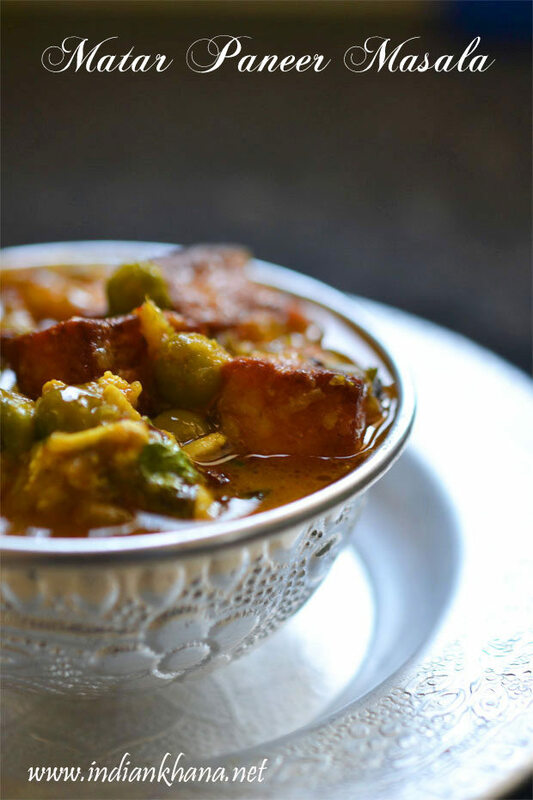 Rice and pulses cooked together in ghee and milk is offered to the family deity after the ritual worship. In essence in the South this Sankrant is a ‘Puja’ (worship) for the Sun God. 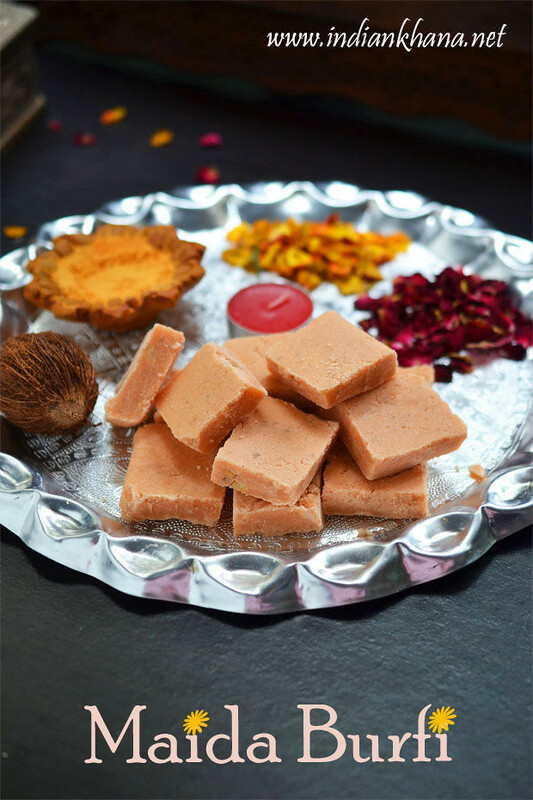 In Maharashtra on the Sankranti day people exchange multi-colored tilguds made from til (sesame seeds) and sugar and til-laddus made from til and jaggery. Til-polis are offered for lunch. While exchanging tilguls as tokens of goodwill people greet each other saying – ‘til-gul ghya, god god bola’ meaning ‘accept these tilguls and speak sweet words’. The under-lying thought in the exchange of tilguls is to forget the past ill-feelings and hostilities and resolve to speak sweetly and remain friends. This is a special day for the women in Maharashtra when married women are invited for a get-together called ‘Haldi-Kumkum’ and given gifts of any utensil, which the woman of the house purchases on that day. In Bundelkhand and Madhya Pradesh this festival of Sankrant is known by the name ‘Sakarat’ and is celebrated with great pomp & merriment accompanied by lot of sweets. 1. 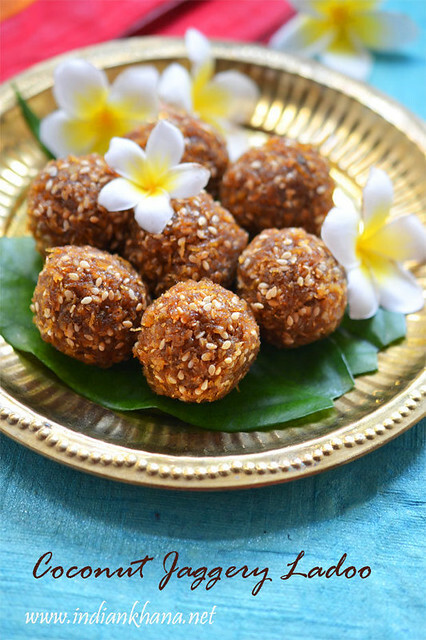 Sankranti is celebrated in all parts of India in different ways and by preparing special goodies on this occasion. Here’s a chance to revive olden days. Prepare a dish, which as a custom is prepared in your house. It can be anything sweet dish, any main dish, savoury snack……list goes on. If you wish you can share with us how Sankranti is celebrated in your region or house. One can post any hand made arts, rangoli. 2. The last date for sending your entry is 25th January 2009. We don’t want participants to prepare dishes for this event specially. 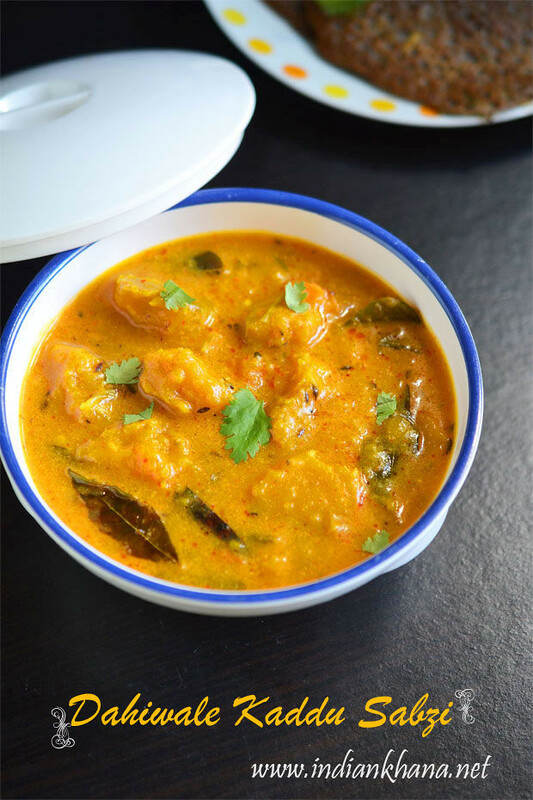 Our idea is participants should send entries with the dishes, which they have actually prepared on Sankranti and share with us their experience and enjoy the festival to the fullest. 3. Bloggers please add a link back to this event announcement, you can include Logo too. There are no restrictions on the number of entries. 4. 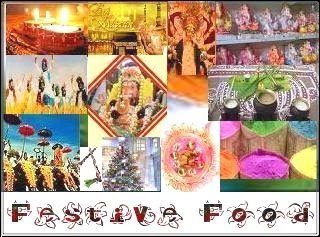 Send in your entries at Indian.festivefood@gmail.com with below mentioned information with subject FF: Makar Sankranti. Let me thank Arundhuti from Gourmet Affair for making this event happening, for designing the logo and for the writeup. I hope that you all will support this event too as all the previous ones. Hey all, hope everyone is doing fine and had a gud start of the year. Me and hubby dear (now I need to get use to this term, I feel very awkward when I say my husband or hubby..:-) ). Ya so, hubby & me spent the new year at quietly at home watching movie and with simple dinner. Looking back to 2008, it was quite a eventful year for me with so many things happening around. From start of 2008, i was fighting with tonsil with paying visit to specialist every week for 4-5 months, it was such a terrible period. Then I started blogging and enter into this new world ...thanks to blog I have so many lovely friends now from all over the world and everyone shows so much love and concern it never feels that we all haven't each other. Then came the 1st bloggers meet for me...it was kinda very cool..I got to know few very gud people and with most of them in frequent touch now. 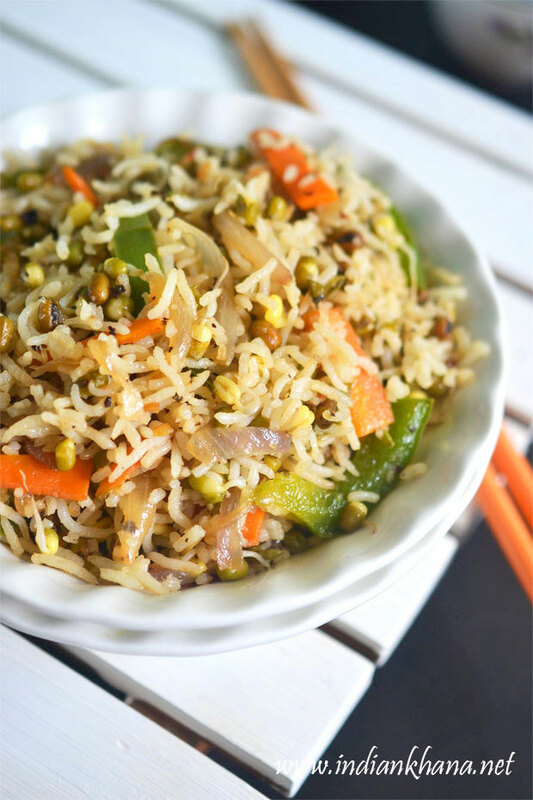 And comes Festive Food Event with Purva, we were just chatting and this idea of festive food popped up & we continue with it. Till date I haven't felt that Purva and me never met, It's like I know her for all my life. Meanwhile I have changed my job and it's a full change of events for me. From managing 1 team, it has been 4 teams now....from sitting in the office, it has become moving around to different client's place. My work has taken new U turn and after initial hiccups....am getting use to this. Inbtw all this work tension, problems, issues, escalation I met Shreya from Mom's Cooking and not even for the second we both taught we were meeting first time, it was like you are meeting your old friend after a long gap...it was wonderful....just such a pity that we couldn't meet in Mumbai again ! Speaking of meeting old friend...last year I met my best frd Raji, while she visited me in SG on her way back to Australia. It was so gud to see her after 2 1/2 years, miss you babe. Towards the end of the year...phew...am getting married! It was all so fast...just happening things around me. And the best thing was ...after almost 10 years I spent my birthday with my entire family including the extended in-law's one too. Here sharing the birthday pics with you all.. There were so many people in my birthday wow....what more I can ask for? After our trip to Bali ...here am back to routine life...the one things missing was blogging and thanks to all of you asking me to blog again....This blog as become essential part of life and there are so many gud frds...sorry I can't name you all but that doesn't mean you are less important. Did I mention Aru? Aru..from Gourmet Affair she is now close friend too.....she has asked me to start blogging or to start a event ..and thus this Sankranti event is coming up. I told Aru its not possible for me to do the prep-work for the event and she happy created the logo and the writeup for the event too..so sweet of her rite? Thanks Aru :)...okie so after this long story lets get to business and here comes Festive Food: Makar Sankranti. I realize this has become a long post..so wait for my next one with the Makar Sankranti Event details. Hello People, how r u? Hope everyone is in pink of health and doing great. First of all wishing everyone Happy New Year...may this new year bring more joy and happiness to all of us and our wishes come true. Now coming back to the post, ya I'm back....just busy with work again ! But ya I missed all of you all this time....and glance few of the blogs whenever I got little time. Thanks to everyone for your wishes, lets enjoy the new year together.